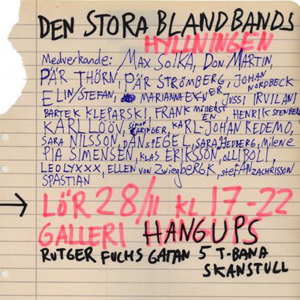 Håkan Lidbo was asked to make a musical interpretation of Stockholms Ethnographic Museum's new exhibition "Magasinet". In this new exhibition a large number of objects that previously was stored in the magazine, are now on display for everyone to explore. 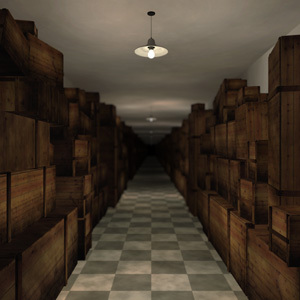 Instead of showing these objects in chronological or geographical order, they are sorted in a more intuitive way. Some would probably call it a chaotic way. More than 6000 objects in all, from all continents and cultures. The music is built from interviews and old field recording made by Swedish explorers from the early 20th century; Sven Hedin, Sten Bergman and Yngve Laurell. Some recordings are almost 100 years old. 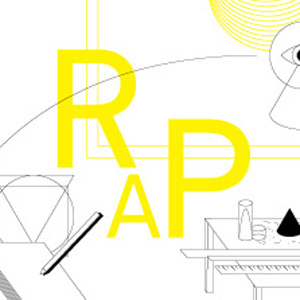 The field recordings are time-stretched into a beat and interviews into some sort of rap. We learn about a long journey through the unknown parts of Asia and how to best prepare a dish of human flesh. The music together with the video, created by visual artist Dan Spegel, was performed live at the opening party for the new exhibition, opened by Swedsih Culture Minister Lena Adelsohn Liljeroth. 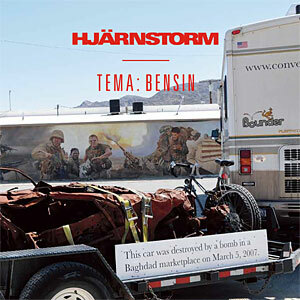 Welcome to the release party for Hjärnstorm #111-112. The topic for this edition of the magazine is Gasoline. For this issue I have written an article called "Spåren efter Mr Music" (eng. "The Tracks of Mr Music"), introducing the reader to the subscription-based Swedish record company Mr Music. This article is a part of my ongoing projects The Life and Times of Mr Music. During the evening I will play selected tracks from the Mr Music-catalog. So prepare yourself for a BLAST FROM THE PAST. 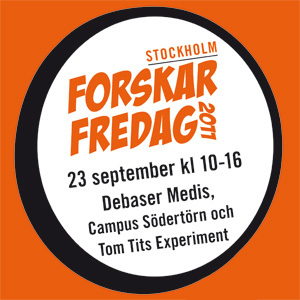 I will participate in ForskarFredag at Debaser Medis. The event is part of the European Commission's Researchers' Night, which aims at enhancing public recognition of researchers, while stimulating more young people to embark on scientific careers and contributing to the improvement of the researchers' working environment. During the day, with the help of thousands of school children, I will create an audiovisual work. My goal is to introduce the kids to the wonderful world audiovisual, abstract art. A screening program with selected classics of abstract cinema will be shown in a small video lounge. 3-step is an interactive installation that allows 3 players to control music and graphics by stepping on dance pads on the floor. The goal is simply to create something groovy, exiting and beautiful. 3-step is developed by Dan Spegel and Håkan Lidbo. More info can be found here: 3-step. And here: HÅKAN LIDBO AUDIO INDUSTRIES. Volt is one of Sweden's leading festivals for electronic music. On June 11th, Volt is celebrating its third anniversary with a stronger program than ever. 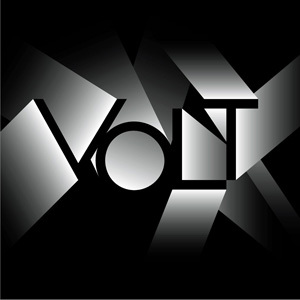 Volt 2011 presents, as in previous years, electronic music in its many forms- from focused, minimalist house and techno to rock hard dubstep, humming ambient and genre-defying experiments. Volt is much more than a music festival celebrating electronic music. Visitors to Volt will also be presented with video art and interactive installations occupying the borderland between man and machine, digital and analog. Welcome to Uppsala and the fantastic environment that is Uppsala Koncert & Kongress. Hypermodern architecture with clean lines, top of the line technology and first-rate acoustics are what make UKK one of the best places in the world to hold an electronic music festival. Volt – for an eclectic electronic journey that is guaranteed to move you. 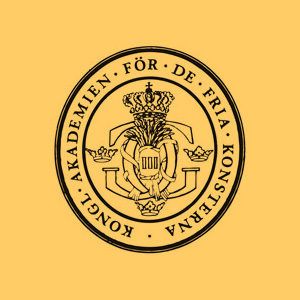 I will be showing three works in the exhibition "Konstakademiens Stipendiater" at The Royal Swedish Academy of Fine Arts. 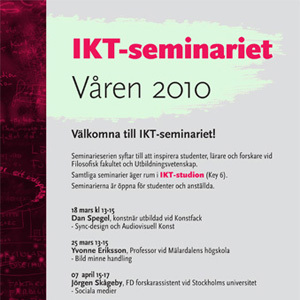 The release party for the book "Fem konstnärliga utvecklingsprojekt", published by Konstfack University Press, will take place at Nationalgalleriet in Gamla Stan, Stockholm. Contributors to the anthology are Dan Spegel, Anna Lundh, Sara Kristoffersson, Anders Ljungberg, Ulf Klarén and Karin Fridell Anter. 18.30 – Anders Ljungberg talks about his project "Det emotionella brukandet"
"Dark Recordings" will be shown at Instituto Cervantes as a part of the screening program "Muestra de arte audiovisual", showing contemporary video art and animation from Spain, Sweden, Argentina and Chile. Sweden: Ulrika Gomm, Roxy Farhat, Anna-Lena Jaktlund, Anna Odell, Malin Pettersson Öberg, Erik Rosshagen, Roger Von Reybekiel, Patrik Kretschek, Miriam Heller-Sahlgren, Dan Spegel, Johan Wilén. Argentina: Gyula Kosice, Johanna Borchardt, Mercedes Moreira, Grupo ETC, Federico Signorelli, Grupo Fosa, Luciana Ojea. Chile: Barbara Anriquez, Alonso Rodriguez y Jaime Alvarado, Elisa Diaz, Isidora Galvez, Vania Bugeno, Jaime Silva. "Sync-design" is a computer-based art form where sound and abstract images are composed simultaneously in complementarity. Dan Spegel will show and talk about his computer animated film "Sync." He will also give a lecture on the history of non-objective film, focusing on the work of Viking Eggeling, Walther Ruttmann, Oskar Fischinger, Mary Ellen Bute, Norman McLaren, James Whitney, John Whitney, Lillian Schwartz, Larry Cuba and Alex Rutterford. 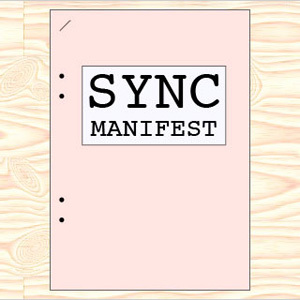 "The Sync Manifesto" is an attempt to write a document that defines the art of "sync." Sync is the art of audiovisual synchronization and its goal is to explore the uncharted territory between music and visual art. A "sync-designer" (i.e. ‘a creator of sync’) is an artist who uses abstract graphics and electronic music to create synchronous structures of light and sound in motion. Sync merges the fields of animation, music production, and computer programming into a new field: "sync-design." The Manifesto is written in a style similar to—and greatly influenced by—early 20th century art manifestos. For the moment it is only available in Swedish. "Sync" is now available on DVD! If you are interested in a copy please drop me a mail. The price is $12/€10/100 SEK + shipping. The project "An audiovisual experimental studio: new technology, old ideas" aims, through both creative artistic practice and theoretical reflection, to explore the relationship between sonic and visual elements. The discussion around the audiovisual expression, has often been conducted in an undertone, perhaps because, it has fallen in between two worlds. On one hand the art and film worlds, and on the other the music/sonic field. 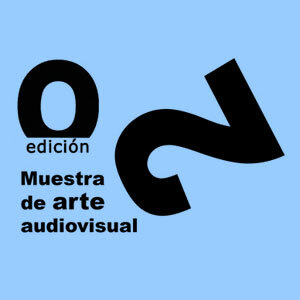 The main aim for this project has been to find a position for the audiovisual work, on its own terms. Today music has become a commodity. Gatefold vinyl’s been replaced by mp3s. The CD is dead. Nothing really matters. In the middle of this world we call the 21st century we have invited some of our favorite artists and music lovers to make the ultimate mixtape. Galleri Hangups will be filled up with colorful covers and cassette tapes. Come and experience the new old (maybe you’ll find that great tape you didn’t even know you needed).